Top Cover is the popular music ensemble of The Band of the Pacific. This high-energy group performs the full spectrum of popular music including classic rock ‘n roll, country, jazz fusion, and today’s top 40 hits. 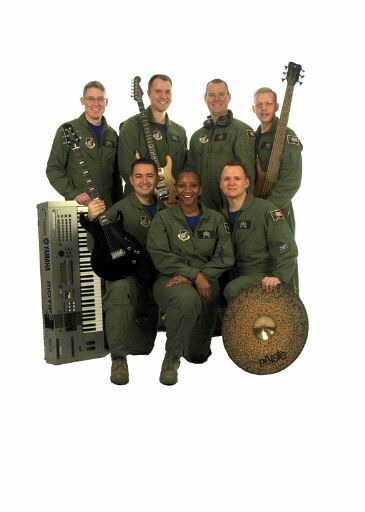 Formed in 1990, Top Cover has entertained audiences throughout Alaska, Hawaii, Malaysia, Indonesia, the Yukon and British Columbia. Their exciting school presentation, “Say No To Drugs,” drives home this important message to our youth through music. Whether it’s enhancing Air Force recruiting, fostering community relations, or bringing a “touch of home” to service members at remote sites throughout the world, Top Cover moves audiences with the driving beat of the best popular music of today and yesterday. The band includes drummer Mike Henrie, bass player Philip Runge, keyboardist Shane Spanier, guitarist Benny Pack, vocalists Amber Grimes and Justin Allen, and audio engineer Joshua Deal. The sun was shining for the performance which was held the deck of the Alaska Tribal Cash building at 5:00 PM. It was a free concert.There was a get-together at Mike Webber’s at 9 pm (after the Science Lecture) to meet the artists. A note and pictures from Laurel Hilts, who chaired this event! A special thanks to those who stuck around to help clean up!